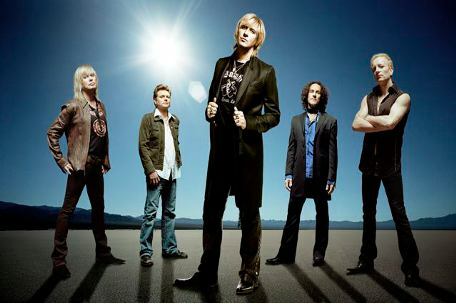 Legendary rockers Def Leppard will release a new live album, 'Mirrorball' this summer. It will include a selection of live Def Leppard classics, three brand new studio songs and a bonus DVD. 'Mirrorball' is Def Leppard's first ever live album, recorded during 'The Sparkle Lounge Tour' and features staples like: "Let's Get Rocked", "Animal", "Pour Some Sugar On Me", "Nine Lives" and "Photograph". Three new tracks, "Undefeated", "Kings Of The World" and "It's All About Believin'" are included at the end. 'Mirrorball' will also be available through digital retailers, the first time their material has officially be made available online. Def Leppard will also be unleashing a brand new website in May, with an aim to be the ultimate Def Leppard fan experience. Also set for release this summer is Leppard's first coffee table book titled "Def Leppard - The Definitive Visual History", with exclusive photos by legendary rock photographer Ross Halfin. The book is released on the 1st June 2011.